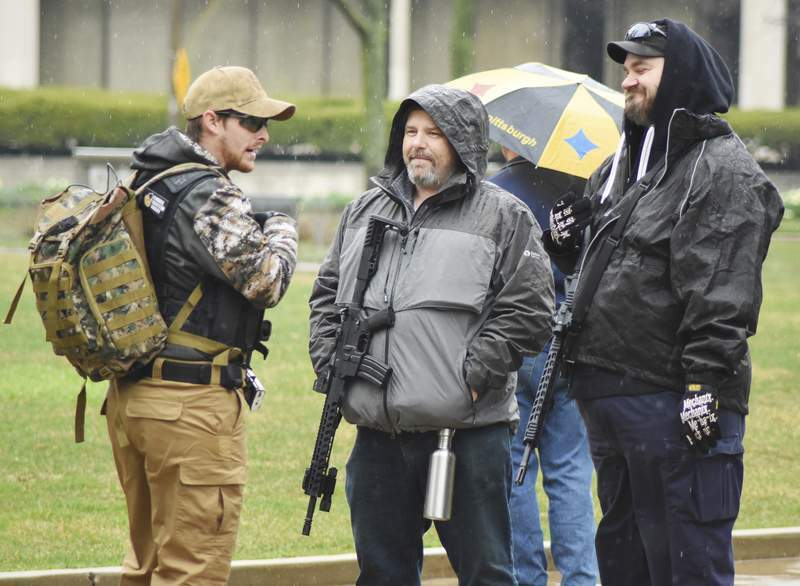 Photos by Rachel Von | The Journal Gazette ABOVE: From left, Kolby Geiger, Mark Long and Brad Jones were among many attending Saturday's pro-gun rights rally on the Allen County Courthouse Green to bring assault-style rifles with them. Fort Wayne City Councilman Jason Arp, right, speaks with Don Westrick during the rally. 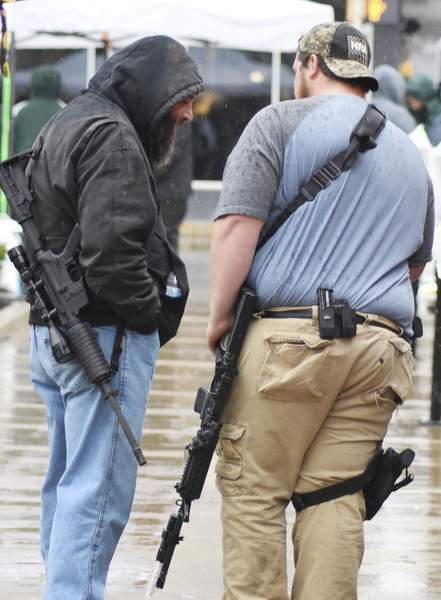 Rachel Von | The Journal Gazette Residents gather in the chilly rain during a local pro-gun rights rally, part of the National Pro Second Amendment Rally, at the Courthouse Green on Saturday. 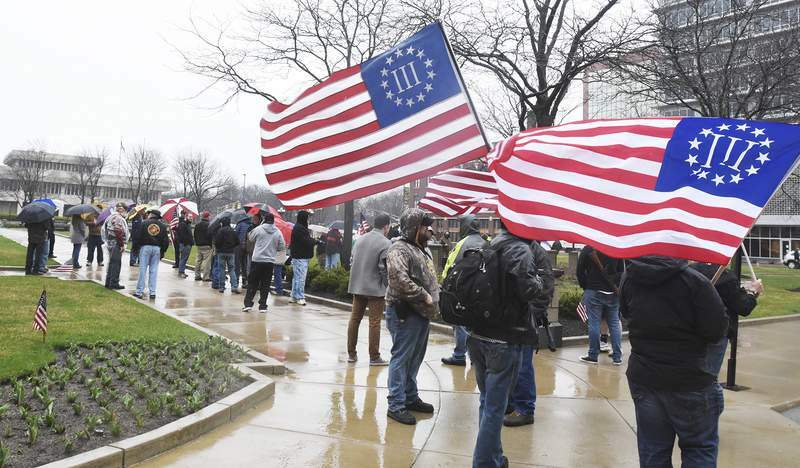 Photos by Rachel Von | The Journal Gazette Nearly 300 people braved a cold rain to attend Saturday’s rally downtown. Rachel Von | The Journal Gazette Kolby Geiger, center, stands around people shielding themselves from the rain during the pro-gun rights rally at the Courthouse Green on Saturday. Organizers urged people to bring AR-15s to the pro-gun rights rally. 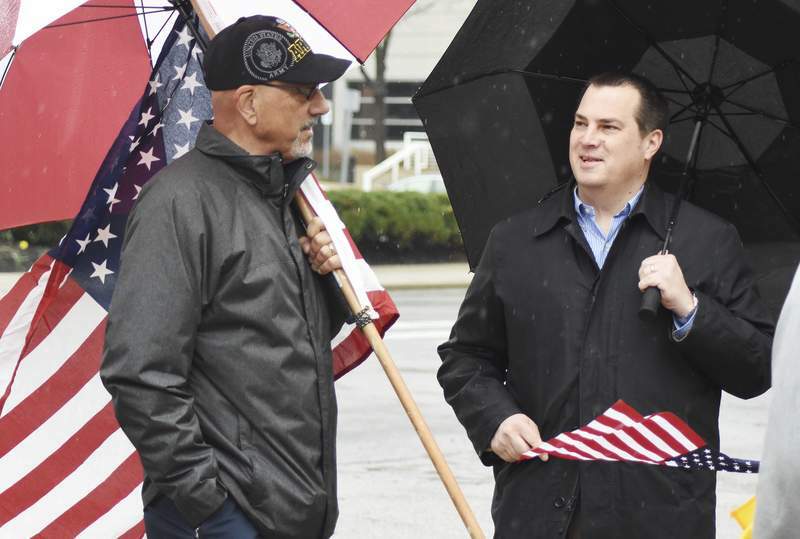 Oath Keeper Bryan Humes took the microphone Saturday afternoon on the Allen County Courthouse Green to warn fellow gun rights activists who worry their gun liberty is being threatened. “One thing you need to do is learn the Constitution,” he told the throng of more than 200 at the pro-gun rights event, part of the National Pro Second Amendment Rally held across the U.S. The rallies are an answer to March for Our Lives, the student-led protest in March that called for gun control legislation. Speakers included Republican City Councilman Jason Arp, who drew on history to explain his stand on gun rights. Arp cited statistics that he said show with the rise of gun laws that allow citizens to arm themselves, violent crime has gone down by 50 percent over the last 25 years, including homicides, rapes and assault. Mass shootings were not addressed at the rally and have, according to a Washington Post report last year, increased from 25 in the 50 years that preceded the Texas University tower shooting Aug. 1, 1966, to 150 since. The study defined mass shootings as shootings where four or more people are killed and do not include gang-related shootings or robberies. Several more have occurred in the last year. At the rally, Nathan Ferrise, a machine builder by trade, said he attended the local March for Our Lives rally and talked to students who believed the arms buy-back in Australia, cited for a reduction in mass shootings, was effective. Ferrise said they were mistaken. Ferrise argued that some of the problems would be solved if people were kinder to each other and that the mentally ill are some of the least-violent individuals. The mass shooters “were not crazy, but all of them are evil,” Ferrise said. The rally, organized by Nicholas Kennedy and Josh Bieck, who was not able to attend, saw a need for the local rally. “There was a void we needed to fill,” Kennedy said, who is in the refrigeration business. The two men quickly advertised the event on Facebook and were surprised by the enthusiastic response. 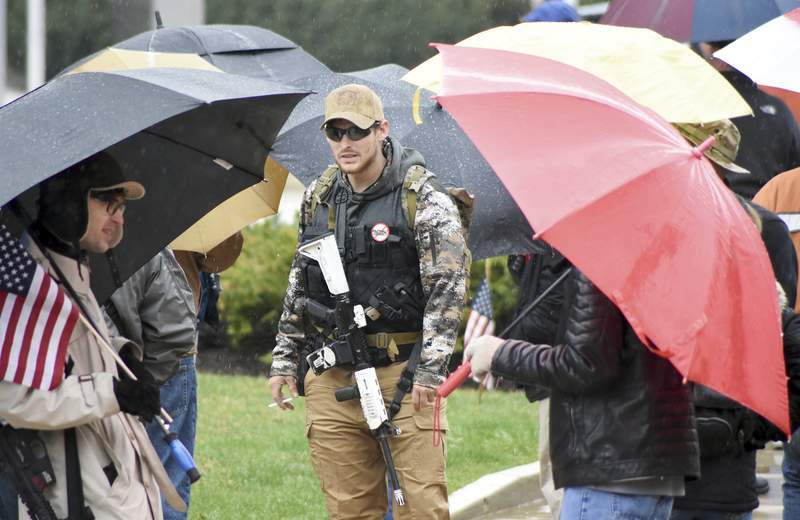 A member of the Oath Keepers said he counted 265 people at the courthouse, Kennedy added. The posting further stated that rebel flags, bandannas and shirts, as well as gang colors and associations, would not be allowed. At the rally, there were several large American flags, a couple of yellow “Don't Tread on Me” flags and a crowd sporting camouflage caps and the occasional red “Make American Great Again” hat associated with President Donald Trump. Many were armed, some with low-slung semiautomatic rifles. Omarh Williams of Fort Wayne was the only black person to speak and one of only a few in the crowd, but he spoke of similarities between the races, including his love of the country and the Second Amendment and his appreciation for military servicemen. His words weren't without a bit of humor, though. When he told his wife he intended to go to the rally, he said, her response was: “You're crazy. You're gonna get shot.” The joke made people laugh.